We are delighted that you are interested in qualifying for SAA’s Level 1 Certificate of Achievement. 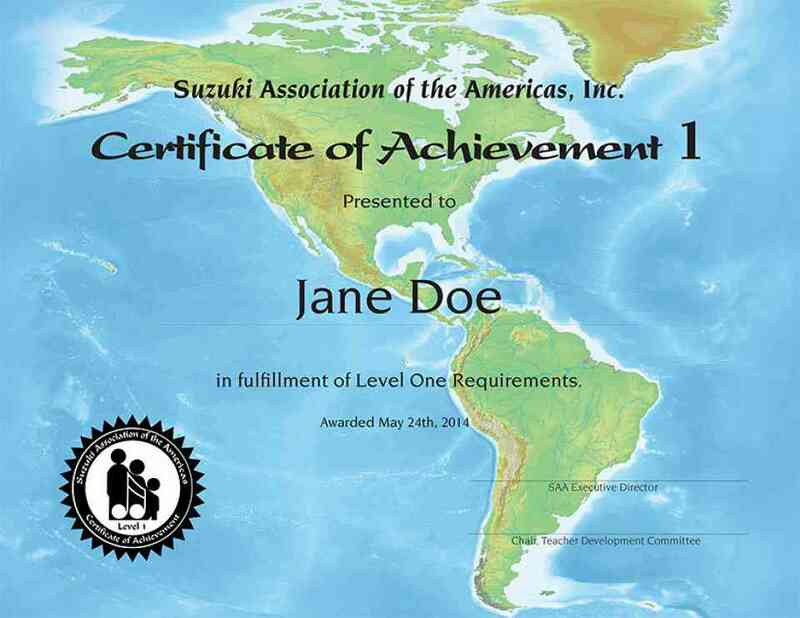 The Suzuki Association of the Americas is committed to excellence in teaching and to establishing standards within the framework of the Suzuki philosophy. Recognizing teachers with a commitment to life‐long learning and self‐improvement is part of SAA’s commitment to excellence. This application is designed so that you, the applicant, will be able to demonstrate your commitment to excellence as a teacher. The process was developed within the framework of the Suzuki philosophy and was designed to encourage self‐evaluation and professional growth. While the SAA Certificate of Achievement Program is not a certification, it provides a viable measure of achievement and commitment beyond the basic registration of units. By engaging in this process you will not only grow as a teacher, but contribute to the growth and professionalism of Suzuki education in the Americas. Instructions – Please read through all instructions before proceeding. Please reread the SAA’s Aspirational Code of Ethics. Your commitment to support and incorporate the SAA Aspirational Code of Ethics in your teaching is indicated by your signature on the Application Form. Submit with your materials a short essay of 250‐350 words, explaining how you have made use of the SAA Aspirational Code of Ethics in the past or how you plan to support its use in the future. Before recording or selecting material for submission please take time to prepare by following the steps below. Before proceeding with recording or making selections from pre‐recorded material, please review SAA’s “What is a Teaching Segment?” below. The recorded sample of your teaching that you submit must meet SAA’s criteria for “Teaching Segment” before it will be reviewed by SAA evaluators. Your understanding of what constitutes a Teaching Segment for the purposes of this application will make it easier for you to make an appropriate selection to submit. What is a Teaching Segment? A teaching segment is a portion of the lesson in which teacher and student work intensely on a particular aspect of a student’s playing. It starts when a specific goal is identified and concludes when the goal is accomplished and an observable change has taken place in the student’s playing. A teaching segment usually ends with an assignment, indicating that the teacher has assessed the student’s and parent/guardian’s understanding and performance of the goal and has ensured that they can practice the assignment effectively at home. A teaching segment is similar to Dr. Suzuki’s “one‐point lesson.” A child’s weekly lesson may well consist of multiple teaching segments. For the purposes of this application you will be asked to submit a Teaching Segment that is focused on a technical or musical aspect other than learning the notes to a piece. Before proceeding with recording or making selections from pre‐recorded material, please review SAA’s Performance and Pedagogy Descriptors©. The descriptors describe elements generally considered to be present in examples of excellent playing and teaching. Your submissions will be reviewed by trained SAA evaluators using these descriptors to support their decisions. Your familiarity with the descriptors will make it easier for you to select your recorded material for submission. It is an uninterrupted 5‐8 minutes in length. It shows you working with a student who is studying anywhere in Books 2‐4. The student is 18 years of age or younger. The student has studied with you for at least two years, or from the beginning of study. The student is working on a piece s/he is playing from memory. The student is not just “playing through” the piece. The student is not working on “learning the notes” of the piece. You and the student are working on a musical or technical aspect of the piece that is only possible to develop because the notes are already learned. You are working step‐by‐step with the student to achieve a positive change in his/her performance of this aspect of the piece. By the conclusion of the segment it is evident that the positive change has taken place and can be replicated in practice at home. There is evidence that the parent understands how to help the student continue to achieve the positive change at home. Piano lessons should take place on an acoustic piano. Your Teaching Segment recording must meet these requirements before it will be reviewed by an SAA evaluator. Submissions that meet all requirements will be reviewed in writing by trained SAA evaluators using the Pedagogy Descriptors to support their decisions. You are responsible for obtaining all necessary consent forms from the students and parents/guardians to submit the video as part of this application. The performances are by two different students. Both students are age 18 or under. Both students have studied with you for a minimum of two years, or from the beginning of study. Each student is working no more than one book beyond the piece being performed. One student is performing a piece or movement selected anywhere from mid‐Book 1 through Book 2 of the Suzuki core repertoire. The other student is performing a piece or movement selected from Books 3‐4 of the Suzuki core repertoire. Each student is performing from memory. Each student is performing with accompaniment (if applicable). While an actual recital setting isn’t required, the student should exhibit appropriate stage presence as if in an actual performance (see SAA Performance Descriptors). For student piano performances an acoustic piano is required. Your Performance recording must meet these requirements before it will be reviewed by an SAA evaluator. Submissions that meet all requirements will be reviewed in writing by trained SAA evaluators using the Performance Descriptors to support their decisions. When recording, a separate microphone is recommended for best sound quality. The video must clearly show the students’ hands (voice applicants should clearly show the student’s face and torso). It is recommended that you use the closest possible camera placement which includes the entire body. For the teaching segment, teacher and student should be in clear view. It should also be evident that the parent/guardian is present and involved in the lesson, even if the parent/guardian is not visible on camera. Please review your video before submission! When you have selected what you feel are the best examples of your teaching and your students’ performances, please take time to review your selections before making final copies to submit as part of this application. Using SAA’s Pedagogy and Performance Descriptors, see if you can identify a number of descriptors which describe elements in your recorded selections and support your opinion that this is an example of excellence in your teaching and in your students’ performance. You may want to work with another Suzuki teacher when examining your video before submitting it. Your selections will be reviewed by SAA evaluators using these same descriptors to support their decisions. If you do not see several descriptors present (or if you notice a number of descriptors missing) in each of your selections, you may want to consider submitting a new or different recording. DVD format or a USB flash drive for your recordings is required. Please assemble the student lesson and the performances onto the same DVD or USB flash drive. Keep the original in case of loss or damage. Label your DVD copies on the disc container in pencil. Also label your disks or USB flash drive with masking tape or easily removable label. Only your name and membership number on the disks/disk container will be needed. Please submit all material together in one package. Incomplete applications will not be accepted. If submitting materials by mail, send to SAA, PO Box 17310, Boulder, CO 80308. For courier services, send to SAA, 2465 Central Ave. #204, Boulder, CO 80301. An application fee of $85 US/CAN must accompany this application. Payment by check, money order, Visa or MasterCard.